Obituary – Lumbers, Joseph Donald « Perry High School Alumni Association, Inc.
– 18 years old, is the son of Mr. and Mrs. Don Lumbers, 908 Delaware street. He was born December 7, 1921 in Perry. He has attended the St. Joseph’s Academy before going to the Perry school. 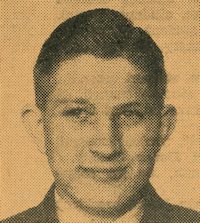 He played halfback and tackle on the high school football team in 1938-39 and 1939-40 and played guard on the basketball team in 1938-39. For football he received a leather jacket and a gold football. He plans to attend the University Junior College next year and study law. ﻿Joseph Donald Lumbers, 47, Del City, formerly of Perry, died at 7 p.m. Wednesday in Presbyterian hospital in Oklahoma City. He suffered a heart attack at his home less than an hour earlier. He had not been ill and his death was unexpected. Rosary will be held at St. Paul the Apostle Catholic church in Del City at 7:30 p.m, Friday. Requiem mass will be in St. Rose of Lima Catholic church in Perry at 10 a.m. Saturday with Rev. Anthony Dockers, pastor, officiating. Burial will be in Mt. Carmel Catholic cemetery. Bill Eisenhour funeral home of Del City is in charge of arrangements. The family has suggested that memorial contributions may be made to the Heart fund or for masses. Lumbers was born in Perry Dec. 7, 1921. He attended St. Joseph school and was graduated from Perry high school. He moved to Del City in 1942 and was a foreman of branch services at Tinker Air Force base. He was a veteran of World war II and a member of St. Paul the Apostle church. Survivors include his wife, Frances, of the home; a son, James J., a student of Oklahoma State university; three daughters, Theresa of Dallas, Mrs. Carolyn Ayres of Irving, Texas, and Patricia of the home; his parents, Mr. and Mrs. Donald Lumbers of Perry; and two granddaughters.